James is a very picky eater. His dad has to get creative—very creative—in order to get James to eat foods he thinks he doesn't like. He presents James with a series of outlandish scenarios packed with fanciful and gross kid-friendly details—like pre-chewed gum as an alternative to broccoli and lumpy oatmeal that grows so big it eats the dog—in an effort to get James to eat. But it is eventually James himself who discovers that some foods are not so bad if you’re willing to give them a try. 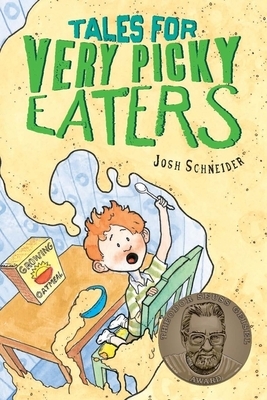 Josh Schneider is the Theodor Seuss Geisel Award-winning creator of Tales for Very Picky Eaters and many popular picture books, including Princess Sparkle-Heart Gets a Makeover, Everybody Sleeps (But Not Fred), and Kid Amazing vs. The Blob. His first book, You'll Be Sorry, was named "Book That Provides Best Ammunition to Parents Weary of Warning Their Kids About Socking Their Siblings" by Publishers Weekly magazine. Josh lives in Chicago with his wife, Dana.